Bad winter weather with bitter cold and thick fogs spread across London during January 1730. As a result there were several sudden deaths and accidental injuries. The Bill of Mortality for the week commencing 6 January shows only two sudden deaths: a child ‘found dead’ in the church yard of St Mary Magdalen in Bermondsey and another person reported as ‘murdered in the goal’ at St George Southwark. This last death was that of a newborn infant deliberately drowned by Sarah Townshend, the mother, who was at the time a felon ‘committed to the New Gaol’. 1 hanged herself being lunatic at St James Westminster. The same evening [Tuesday 6th], during the time of the prodigious fogs, a man mistaking his way, fell into the fleet ditch, by which accident he beat out one of his eyes, and was very much bruised. Another man fell into the Common-shore [sewer] in King Street, Westminster; and a great many more accidents happened on the like occasion, both in the streets of London and Westminster; as also on the River Thames. The same day, a house pretty much out of repair in Bedfordbury fell down; a bricklayer’s labourer who was employed to pull off the pantyling to lighten it, had got off about 200 [tiles], and was gone to get himself a pint of beer being cold, when it fell down without doing any further damage. 1 by a fall from a ladder at St Giles without Cripplegate. Here we see information on two separate weeks taken from the London Bills of Mortality exactly one year apart. The observant will have already noticed that both weeks have some things in common; drownings at St Katherine by the Tower and deaths caused by falling from ladders. The coincidences have however only just begun. Let’s set aside the drownings, which were so frequent on the Thames that such similarities are often encountered in the Bills, and instead focus on the ladder casualties. A 17th century ladder in use for fire fighting: Such ladders claimed the lives of 88 Londoners between 1654 and 1735. What is evident from these reports are that both falls took place in the same parish, St Giles Cripplegate, yet given the size of that suburban parish this is perhaps not so surprising. The real coincidence comes when reference is made to the parish burial register. Here we find that the victim in 1684 was a plasterer named James Fox, the victim in 1685 was a man named John Cooper who we find was – and here’s the real coincidence – also a plasterer. So we have two men in the same occupation both falling to their deaths from ladders, in the same place and exactly one year apart. One suspects that for those who could remember the earlier event the 1685 incident gave them plenty to contemplate! 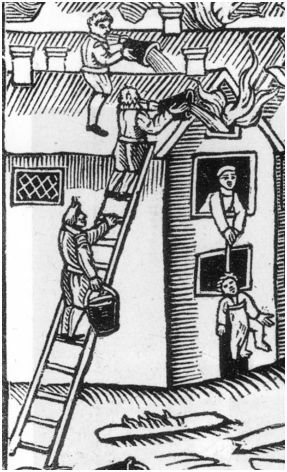 Between 1654 and 1735 the Bills of Mortality record the deaths of eighty-eight individuals who fell from ladders. This was not however the most significant cause of fatal falls, that was actually the more mundane situation of falling down stairs (which claimed 216 victims). Falling from ladders was however almost certainly related to occupational activities and hence we find bricklayers, carpenters painters and plasters in the accounts of ladder-related accidents. It is also notable that falls in these occupations also peaked during the months of May – the start of the building season – and again in August through to October – as building worked became intensified before winter weather curtailed such activity. This week in 1728: Falling out of windows and into gin! 1 scalded in a distillers copper, a young man, at St James Clerkenwell. A small but interesting group of fatalities from this first week of March in 1728. Falls from buildings, and especially windows, tended to occur disproportionately often during this first quarter of the year throughout the later 17th and early 18th centuries. Perhaps the first glimpses of warmer weather enticed people to open windows previously kept firmly shut against the colder weather, or maybe it just represents the recommencement of construction activity after the winter ‘break’. Although adults were often found washed up on the shores of the Thames it was rarer to encounter the body of a child. Whether such fatalities were suicides, accident or murder victims was hard to tell, in this case however the first category might be fairly safely omitted. Finally the young man scalded to death was most likely a distiller’s (or brewer’s) servant or possibly apprentice. Just goes to show that it wasn’t only the consumers of gin who suffered early deaths but, as on this occasion, it could also be the manufacturers. 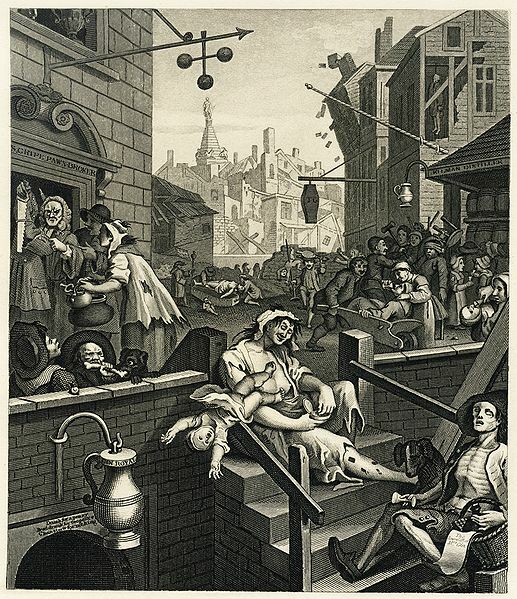 Hogarth’s ‘Gin Alley’ engraving of 1751 depicts the detrimental affects of gin but in this case on the consumers not the producers. We will return to this, and other of Hogarth’s works, in future posts as they often feature aspects of violent death in the metropolis. A man killed by a large quantity of earth at St Giles without Cripplegate. ‘Two men digging under a laystall at Mountmill near Islington, a great quantity of earth fell upon them, whereby one was killed the other much hurt.’ The Gentleman’s Magazine, 5 February 1731. London’s waste swept from streets and gutter, or extracted from cesspits, was collected and disposed of during the 17th and 18th centuries by being dumped at a number of sites on the outskirts of the built-up area of the city. Over the years such dumps, or laystalls, often became significant local landmarks forming mounds or mounts several tens of feet high (see the section of Rocque’s 1747 map shown below which indicates at least four of Islington’s laystalls; one of which may have been known as the ‘Mountmill’). The material that made its way onto these laystalls was frequently scavenged by the poor for objects or materials that could be re-used, sold on or simply burnt as fuel. It would seem that on this occasion, as on several others, the unfortunate diggers undermined the inherently unstable mound and were buried alive in its filth and waste. Section of Rocque’s map of 1747 showing the laystall mounds in the vicinity of the Islington Roads to the north ofLondon(the lower mound in the centre is possibly the ‘Mountmill’ in question as a road of that name is just to the south of this area). For a modern take on this type of event see this blog entry on rubbish tip landslides, (see post of 22 June 2008). Contemporary newspapers, such as Applebee’s Original Weekly Journal and the Weekly Journal or Saturday’s Post, support the Bills of Mortality by making it clear that Aron did not die alone. The newspapers report ‘two boys, whose parents lives in Swan Alley, Coleman Street’ … ‘were drowned in the pond behind the Haberdashers Alms-House, the ice breaking under them as they were sliding on it’. With only one burial noted in the parish register of St Stephen Coleman Street it suggests that these boys were more likely friends and neighbours rather than brothers. 1 burnt at St Paul Covent Garden. This account of sudden death from London’s teeming streets in 1672 is actually fairly typical. The use of the term ‘killed’ within the Bills of Mortality is not particularly helpful in describing the actual cause of death but a wider reading of the records suggest the use of this phrase was most often associated with those accidentally killed during casual violence; in other words various forms of manslaughter. As for the role of alcohol as an agent of death the specific noting of those who died by ‘excessive drinking’ clearly had moralising overtones. Noting the drunken state of the woman who (in all probability) fell into the fire in the riverside parish of Shadwell perhaps represents a more direct attempt to evoke a salutary lesson while warning of the evils of drink.